The Sforzesco Castle, a 15th century castle that served as a residence for Milan's ducal family, is one of the most well known historical buildings in Milan which now houses several of the city's museums and art collections. It is also home to the museums of applied arts, ancient art, historical musical instruments, Egyptian art and fine arts. The castle was demolished and rebuilt many times over the centuries. 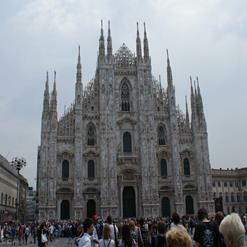 It has now become a symbol of various historic and dramatic events which reflect the story of Milan and its history. The castle houses several museums today; the best known of these is the Pinacoteca del Castello Sforzesco.